Cari ospiti, può un festival di cult essere reinventato? Ovviamente può, specialmente se dà più spazio a entrambi, eventi accertati e nuovi e, in tal modo, risponde meglio alle esigenze e ai desideri degli ospiti e dei protagonisti – le foodladies e gli chef di celebrità internazionali che arriveranno da tutto il mondo. Il St. Moritz Gourmet Festival è sempre stato caratterizzato da eventi eccezionalmente vari e ricchi di cultura. Vorremmo mantenerlo, ma in un’atmosfera più rilassata e piacevole. Per tutte queste buone ragioni, è stato deciso di cambiare corso per il futuro del 25° anniversario in poi. Per la prima volta, il St. Moritz Gourmet Festival si svolgerà per nove giorni e due weekend, a partire da venerdì 12 a sabato 20 gennaio 2018. Al centro del festival si svolgerà un cambio di cinque dieci chef internazionali di celebrità. All’inizio dell’anno permetterà agli chef e ai fornitori di avere più tempo per sperimentare e godere delle eccezionali delizie culinarie. Prendete nota delle date del nostro Festival da subito!! I biglietti per il vostro soggiorno culinario al St. Moritz Gourmet Festival 2018 saranno disponibili già dai primi giorni di novembre. Sul nostro sito web e su Facebook e Twitter continueremo a fornirvi informazioni aggiornate sugli chef ospiti e sul programma completo del festival e sulle attraenti sistemazioni speciali dei nostri hotel partner. Rimanete sintonizzati! Non vediamo l’ora di darvi il benvenuto al St. Moritz Gourmet Festival 2018. Cordiali saluti. Always keeping pace with the times, the 2018 St. Moritz Gourmet Festival is bringing together nine master chefs, male and female, for the 25th Anniversary of the event, who are all setting international standards in fine dining with their individual gastronomical skills. Right at the beginning of the year and for the first time over nine days, the new festival format offers epicureans the chance to visit popular, legendary events as well as exciting new ones, from January 12th to 20th , 2018. Advance tickets for the festival go on sale on Friday, November 3rd, 2017. To present the guest chefs, the organisers of the festival had issued invitations for a press conference today at the Baur au Lac in Zurich. 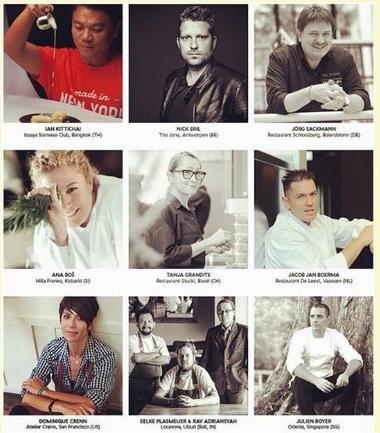 “We are extremely delighted that some highly interesting Master Chefs of both genders from Europe, Asia, the USA and Switzerland have responded to our call and will be coming to the Upper Engadine. Whether they are highly distinguished in the leading gourmet guides or top-ranking on the “World’s Best” list, the very individual cooking styles and skills of this year’s guest and local chefs will no doubt make the hearts of our epicurean visitors beat a little faster”, said Heinz E. Hunkeler, Vice President of the St. Moritz Gourmet Festival association, at the beginning of the conference. From Friday 12th up to and including Tuesday 16th of January 2018, festival guests will be able to savour the cookery skills of Ana Roš from the Hiša Franko in Slovenian Kobarid. This year, Ana Roš has been distinguished as “World’s Best Female Chef”. Together with her host, Chef de Cuisine Mauro Taufer, she will be serving up exceptional dishes at the Kulm Hotel, St. Moritz. Thailand’s most famous celebrity chef, Ian Kittichai from the Issaya Siamese Club in Bangkok, will be putting his sensational cookery skills on display at the Badrutt’s Palace Hotel in St. Moritz, with dishes such as his legendary banana flower and palm heart salad “Yum Hua Plee”. Nick Bril merges Asian aromas with Nordic perfection: Europe’s coolest two-star chef from The Jane in Antwerp will rock the kitchen together with local chef Gero Porstein at the Carlton Hotel in St. Moritz. At the Hotel Waldhaus Sils in Sils-Maria, two-star chef Jörg Sackmann from the Schlossberg Restaurant in the idyllic Black Forest will be creating refined dishes and stimulating flavours together with the Waldhaus kitchen team assembled around chef Fabian Marolf. From Tuesday 16th up to and including Saturday 20th of January 2018, the most acclaimed Swiss female chef Tanja Grandits from the Stucki in Basel, will enthuse with her incomparable aroma cuisine at the Grand Hotel Kronenhof in Pontresina, together with Chef de Cuisine Fabrizio Piantanida. Distinguished in 2016 as “World’s Best Female Chef”, Dominique Crenn from the Atelier Crenn in San Francisco with her poetic style of cookery, will form a captivating duo with Chef de Cuisine Matthias Schmidberger at the Kempinski Grand Hotel des Bains in St. Moritz. Three-star Chef Jacob Jan Boerma, from De Leest in Dutch Vaassen, will demonstrate his extraordinary cookery style with local Chef Michel Hojac at the Hotel Giardino Mountain in St. Moritz-Champfèr. Indonesian avant-garde dishes will be put on the plates by Eelke Plasmeijer and Ray Adriansya, from the Locavore in Ubud, Bali (No. 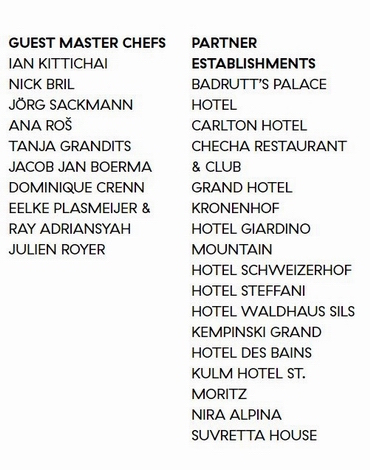 22 in Asia’s 50 Best Restaurants 2017), working side by side with Chef de Cuisine Florian Mainzger at the Hotel Nira Alpina in Silvaplana. 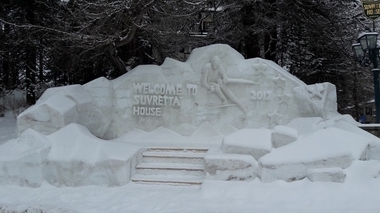 Together with his host Fabrizio Zanetti, two-star Chef Julien Royer from the Odette in Singapore will enthrall the guests at the Suvretta House Hotel in St. Moritz with his multi-prize-winning “Essential Cuisine” (No. 9 and “Highest New Entry” in Asia’s 50 Best Restaurants 2017). The festival programme was presented at the press conference. It will start off on Friday evening (January 12th, 2018) with the Grand Julius Baer Opening, to be held for the first time at the Kulm Hotel, St. Moritz, followed by now six evenings with Gourmet Dîners and a total of twelve Gourmet Safari trails, along with the Kitchen Party as the ultimate summit meeting featuring all of the star-crowned chefs on Tuesday evening (January 16th , 2018) at the Badrutt’s Palace Hotel, and the Great BMW Gourmet Finale on Saturday evening (January 20th , 2018) in the new festive venue of the Suvretta House Hotel. Furthermore, festival guests can look forward to the already legendary special events such as The Tasting, Fascination Champagne, Celestial Wines and the Chocolate Cult. The new festival format offers far more room for new moments of enjoyment. For instance, two-star chef Rolf Fliegauf will be inviting guests to a deliciously casual Tavolata in the Ecco St. Moritz at Hotel Giardino Mountain. At the exclusive workshop “It’s all about truffles” Master Chef Tanja Grandits will introduce guests to delicious variations on this popular tuber, followed by a truffle menu in the gourmet restaurant Kronenstübli at the Grand Hotel Kronenhof. At the unique presentation of the VALSER Next Generation Pop-up Dinner «From Peak to Plate» at the Waldhaus Sils Hotel, the up-and-coming young chefs of the marmite youngster selection will create several courses based 100% on Swiss produce and inspired totally by the Grisons mountains. Finally, a Russian New Year’s Brunch with party to follow, will be celebrated by Reto Mathis in the CheCha Restaurant & Club on Salastrains in St. Moritz. 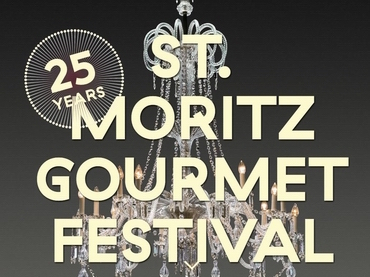 St. Moritz Gourmet Festival 2018 – Celebrating 25 Years! 20th January 2018 Great BMW Gourmet Finale (Suvretta House). Ian Kittichai, Thailand’s most prominent celebrity chef, looks back on a storybook career – from street food to fine food. As a child, he accompanied his mother every morning to the market to buy the best ingredients for their curries, before they both offered them for sale on a handcart on the streets of Bangkok. As a young man, Ian Kittichai was trained in Haute Cuisine in England and Australia, followed by significant professional stints in France, Spain (El Bulli), the USA and Japan. Aged only 30, he became the first Thai Executive Chef of a five-star hotel. Today, he runs an international F&B management and consulting firm, Cuisine Concept Co. Ltd., is able to boast of restaurants around the world ranging from casual to premium, has a cookery studio and a number of high profile television deals. “I use traditional Thai ingredients and flavours with classic and progressive cooking methods”, says Ian Kittichai divulging the secrets of his success, on which he bases the most extraordinary dishes such as banana blossom and heart of palm salad “Yum Hua Plee” served in his Bangkok flagship restaurant Issaya Siamese Club. Nick Bril ranks as Europe’s coolest top chef. Whenever the Dutch two-star chef is not behind the stove, he delights his audience as a successful DJ on the turntables at the trendiest parties. At The Jane, he pulls all the strings as Chef de Cuisine and Sergio Herman’s business partner. The restaurant is located in a former church in Antwerp, fitting perfectly with Nick Bril’s philosophy: “After all, cooking is my religion”. In the creations of this 33- year old exceptional talent, Asian aromas blend with northern perfection: exotic and accessible, well thought out and pure. For instance, in one of his signature dishes: poached lobster tail with dashi butter sauce. Nick Bril started his culinary career at the age of 14, as a dishwasher. Later Nick Bril worked as Chef de Cuisine alongside his mentor Sergio Herman at Oud Sluis, a restaurant that under Herman’s leadership, consistently held three Michelin stars and a fabulous score of 20 GaultMillau points for ten years. In 2014 the two of them started a new chapter at The Jane, in collaboration with architects, designers and artists as a total gastronomic experience. Jörg Sackmann comes from a renowned family in Baiersbronn, in the picturesque Black Forest, who has run the Hotel Sackmann there for the past 90 years. After his training with great pioneers such as Harald Wohlfahrt and Eckart Witzigmann, Jörg Sackmann turned the Schlossberg Restaurant into a Mecca for epicureans in 1993 and has continued to pamper his guests here with his culinary skills ever since. In addition, a large television audience enjoys his regular appearances demonstrating refined recipes as part of the “ARD Buffet” show. He always masterly combines regional produce with Mediterranean and Asian accents in his dishes, with herbs and spices from all over the world playing a central part – for example, in his signature dish “Wild Sockeye salmon in Jaroma cabbage with eucalyptus bark, barberries and potato broth”. The 56-year old finds his inspiration on his travels, and as the proud father says, his son Nico is already assisting him in the kitchen, showing equal amounts of passion for haute cuisine and “bringing along many revolutionary ideas”. Ana Roš received the award “World's Best Female Chef”. The Slovenian creates each of her avant-garde dishes as a unique composition – always based on her philosophy: “Territory, season and myself”. The natural treasures – her ingredients – are literally growing on her doorstep. Her restaurant Hiša Franko is located in the small town of Kobarid, in a picturesque valley with unspoilt meadows, lakes, rivers and forests. A secret spot for gourmets until, in 2016, the Netflix series “Chef’s Table” introduced Ana Roš’ art of cookery and almost overnight she became world famous. Ever since, her table reservation list has literally been bursting at the seams. Now aged 44, Ana Roš taught herself to cook. In her youth, she was part of the national Yugoslavian ski team before studying International Science in Triest in neighboring Italy. But in 2003, instead of starting a diplomatic career, she made the courageous decision – along with her husband and sommelier Valter Kramar – to take over his parents’ restaurant in Kobarid. Executive Chef Fabrizio Piantanida welcomes guest Master Chef: TANJA GRANDITS Rest. Stucki, Basel (CH) Tanja Grandits, Switzerland’s most highly awarded top lady chef has developed a very personal and distinctive style. Overwhelmingly aromatic and straightforward, yet technically elaborate compositions are her trademark and make the Stucki, her restaurant in Basel, a choice destination for gourmets from far beyond the Confederation’s borders. Tanja Grandits choses a main flavour and main colour for each dish. “I take a basic product, which can be a piece of meat, a fish or even an egg, and I add a vegetable that normally determines the colour of the dish. Colours are a very good means of structuring my work, and at the same time I can be creative within these structures”, she explains her working strategy. For example, in Tanja Grandits’ dishes, a sea bass is combined with basil juice, cucumber and green tea guacamole, or boletus with vinegar caramel, aubergine gnocchi and pine miso. Lately, the 47-year old chef was the first laureate to be honoured by Michelin with the “2017 Female Chef Award” for her poetic play with aromas, colours, herbs and textures. Jacob Jan Boerma delights guests with dishes revealing a perfect interaction of acidity, spices and vegetables. A skilled master of classical haute cuisine yet also keenly experimental with new methods, ingredients and aromas, the native Austrian prefers to use produce from the sea and Scandinavian nature, such as North Sea langoustine, in his creations. Jacob Jan Boerma describes himself as an “uncompromising perfectionist”, his ultimate objective being to source quality produce as the basis of his success. “A chef can never lie about the quality of his product!”. After stints in European star-crowned establishments and inspired by stays in the world’s most exciting kitchens, now aged 45, he opened the De Leest restaurant in the provincial Dutch town of Vaassen with his wife and sommelier Kim Veldman in 2002. Alongside top awards from Michelin, he was chosen as one of the 50 best chefs in the world (Le Chef). Since 2016, the cuisine in Amsterdam’s White Room at the NH Grand Hotel Krasnapolsky also bears his characteristic culinary signature. “It’s your attitude, not your aptitude that determines your altitude”, says Dominique Crenn, awarded “World’s Best Female Chef” in 2016. As for her creations, this native of France finds her inspiration in the visual arts. For each of her menus she composes a poem to get in the right mood. This is how her modern cookery “still lives” emerge on the plate. An expression of her personality, because for her, living and cooking for guests is like poetry she loves to share with others. Her distinctive style is testimony to her keen interest in using only seasonal produce – fresh from the market, fresh from the sea – and her brilliant talent for inspiring classical haute cuisine in an entirely new way. Her background reflects international influences. Aged 51, Dominique Crenn achieved great cookery fame in renowned restaurants from Los Angeles to Jakarta, before realising her ultimate personal dream at Atelier Crenn in San Francisco. In next to no time, she became the first female chef in the USA ever to receive two Michelin stars for her style of cookery. Ray Adriansyah (from Indonesia) and Eelke Plasmeijer (from the Netherlands), came to know and respect each other professionally in Jakarta. They moved to Ubud in Bali where they took over the culinary sceptre at Alila Hotels & Resorts. The Bali national Adi Karmayasa also started his career as restaurant manager here. In 2013, opening their own restaurant, Locavore, the trio realised their dream of celebrating avant-garde cuisine based exclusively on Indonesian products. Their creative skills and concept have attracted much attention and recognition. In 2017, Locavore was awarded “Best Restaurant in Indonesia”. As the name would suggest, Locavore is all about local produce, from the raw Balinese abalone to the Sumbawa Island oyster, and even through to the plates and glasses, which are all made in nearby workshops. «Into the Sawah» best illustrates the whole regional concept. For this dish, all the ingredients used grow, live or swim in the Ubud rice fields. «It allows our guests to have a miniature rice field on their plate and to savour it with all their senses», says Ray Adriansyah, in explaining their philosophy. Chef Julien Royer is co-owner of Odette, a 2-Michelin starred Modern French restaurant located at the iconic National Gallery Singapore. Termed Essential Cuisine, Royer’s dishes are honest and refined in their simplicity. Sans culinary pretence, his menus showcase some of the best produce from around the world, all treated with the delicate and astutely restrained touch which has become Royer’s signature. In 2017, he led Odette to its historic debut on the Asia’s 50 Best Restaurants 2017 list at 9th place – the highest new entry in the history of the list – and the World’s 50 Best Restaurants 2017 Long List at 86. The restaurant was also inducted into the prestigious Le Grandes Tables Du Monde in the same year. Royer’s career has taken him to Paris, London and the West Indies, where he cultivated his culinary signature working under Michel Bras, Bernard Andrieux and Antonin Bonnet. He moved to Singapore in 2011 to take on the role of Chef de Cuisine at JAAN at Swissôtel the Stamford, before opening Odette in collaboration with The Lo & Behold Group in 2015. 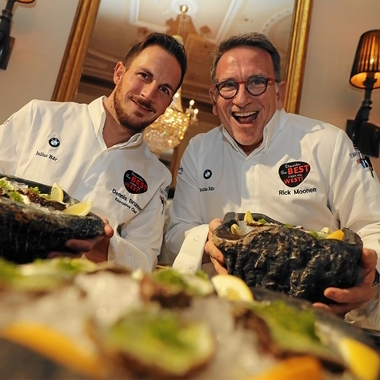 For a quarter of a century, the St. Moritz Gourmet Festival has gained cult character throughout the world. Over the last 24 years, almost 80,000 gourmet food lovers have travelled to the Upper Engadine, in order to be spoilt in the festival partner hotels and event locations by nearly 200 international master chefs from more than 30 different nations. However, the focus is not on competition, but on collegial cooperation between famous star-crowned chefs from all over the world and equally highly distinguished chefs de cuisine from our partner hotels. The aim, challenge and stimulus for all involved in the St. Moritz Gourmet Festival is mutual inspiration and the creation of great things together, so the guests can savour culinary highlights for all the senses. 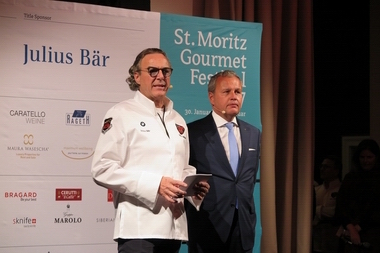 Since first being held in 1994, the festival has been organised by the partner hotels and event locations, who have all joined forces in the St. Moritz Gourmet Festival Association. They are the hosts and provide the stage for the top international celebrity chefs as well as the venues for all the Gourmet Dîners, official and special events. In addition, for the new format the festival can rely in the future on the continuing support of renowned, longstanding sponsors and partners. Advance ticket sales for the festival will start on Friday, November 3 rd , 2017. 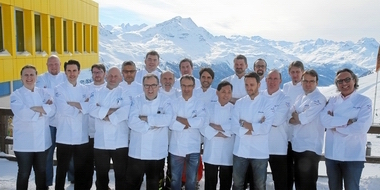 Tickets will be available from 10 a.m. on the website www.stmoritz-gourmetfestival.ch. Ticket sales for the Gourmet Dîners and several special events are not part of this sales schedule (see programme details on the website). The festival partner hotels are offering a whole multitude of individual deals. These include event tickets and accommodation as well as certain extras that will make a stay in one of the partner hotels in question very attractive indeed! These offers can also be found on the website www.stmoritz-gourmetfestival.ch under the respective hotel portraits and can be booked with the hotels directly. Current news updates can be found on the website www.stmoritz-gourmetfestival.ch and on Facebook. The partner hotels Badrutt’s Palace Hotel***** Superior, St. Moritz; Carlton Hotel***** Superior, St. Moritz; Grand Hotel Kronenhof***** Superior, Pontresina; Hotel Giardino Mountain***** Superior, Champfèr/St. 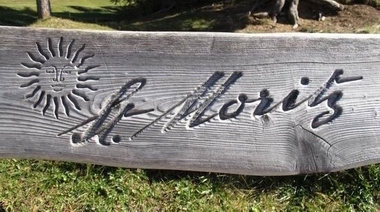 Moritz; Nira Alpina**** Superior , Silvaplana-Surlej; Hotel Waldhaus*****, Sils-Maria; Kempinski Grand Hotel des Bains***** Superior, St. Moritz; Kulm Hotel St. Moritz***** Superior, St. Moritz, and Suvretta House***** Superior, St. Moritz, as well as the event locations Cava Bar, Hotel Steffani****, St. Moritz; CheCha Restaurant & Club by Mathis Food Affairs, St. Moritz, and Hotel Schweizerhof**** Superior , St. Moritz. 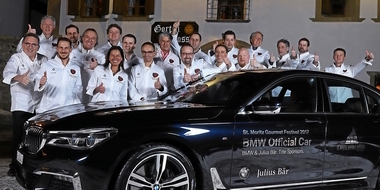 BMW (Schweiz) AG; Title Sponsor: Bank Julius Baer & Co. AG; Main Sponsor: Valser; Co-Sponsors: Caratello Weine St.Gallen, Confiserie Sprüngli AG, G. Bianchi AG, Laurent-Perrier Suisse S.A., Martel AG St.Gallen, Maura Wasescha AG, Maximum Wellbeing AG Schweiz, Rageth Comestibles AG, SIBERIAN VODKA AG; Suppliers: Bader + Niederöst AG, BRAGARD SUISSE AG, CERUTTI „il Caffè“, Hugo Dubno AG, Schwob AG, sknife – swiss knife; Local Carrier: Massé und Partner Transports GmbH; Local Media Partner: Engadiner Post/Posta Ladina; Media Partners: dasfilet.ch (Gourmetblog), htr hotel revue, ibexmedia GmbH, marmite – Zeitschrift für Ess- und Trinkkultur, Gastronomie & Tourisme. Progetto Vino Collisioni in Friuli V. G.